Many beautiful, stylish energy-efficient fans and fixtures are available for consumers looking for ways to conserve resources. I have a large kitchen with a fan in the cooking area and would like to add one in the eating area. What kind of fan is most appropriate for the kitchen and should the two fans match? 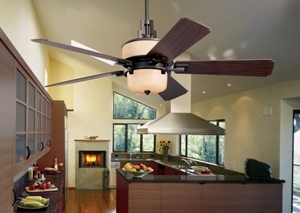 It is preferable to match the new fan to the existing fan’s style, color and number of blades. Your best option is to go to your local ALA-member lighting showroom with a photo of your current fan and the name of the manufacturer, so that a lighting professional can help you make the best match. Interested in learning more about how to save money and energy when lighting your home? Click here to view videos of lighting professionals talking about lighting on a budget, as well as other home lighting topics. It’s hot and as energy usage continues to soar, so do the electricity bills. Here are three ways to use less energy and save money. Switch out incandescent light bulbs with compact fluorescent versions. A compact fluorescent lamp (CFL) provides the same amount of light as an incandescent by using only one-quarter of the electricity. For example, a 26-watt CFL provides the same amount of light as a 100-watt incandescent. To see the wattage comparisons for different types of light bulbs, click here. Install ceiling fans in frequently occupied rooms. Using a fraction of the electricity used by an air conditioner, a ceiling fan can make a room feel noticeably cooler. The thermostat can be raised by six degrees – say to 78 degrees — and when a ceiling fan is in use, the room will feel as if it is only 72 degrees. Lighting controls are an excellent option for saving energy. It is not necessary to invest in a comprehensive control system where the entire house is rewired. There are simple and less-expensive methods for controlling light to save energy, such as motion sensors, timers, photocells that operate according to perceived light levels, and dimmers. When an incandescent is dimmed, the same approximate percentage of dimming is converted to energy savings.